Does My File Contain Transparency? You apply a blending mode or an Opacity value other than 100% in the Transparency panel. You apply the Effect > Stylize > Drop Shadow feature. You apply the Effect > Stylize > Feather feature. You apply the Effect > Stylize > Outer Glow feature. You apply the Effect > Stylize > Inner Glow feature. You apply any “below-the-line” Photoshop effect from the Effect menu. You place a PDF file that contains transparency. You place a native Photoshop file or layered TIFF that contains transparency. You apply a Bristle brush stroke that contains a paint opacity value of less than 100 percent. It would be helpful to know whether your document uses transparency or even will require either of the two levels of rasterization discussed earlier. You can use the Flattener Preview panel (Window > Flattener Preview) to tell whether a document has transparency effects in it, as well as to preview areas that will become rasterized in the flattening process. Figure 11. If your file contains no transparency, you don’t have to worry about the effects of flattening. Figure 12. 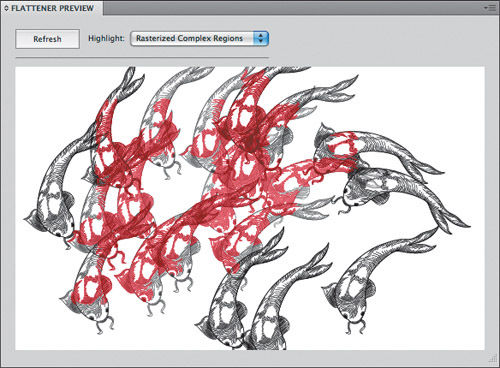 You can use the Flattener Preview panel to identify areas that Illustrator deems as complex regions, giving you a heads up for what areas will be rasterized. 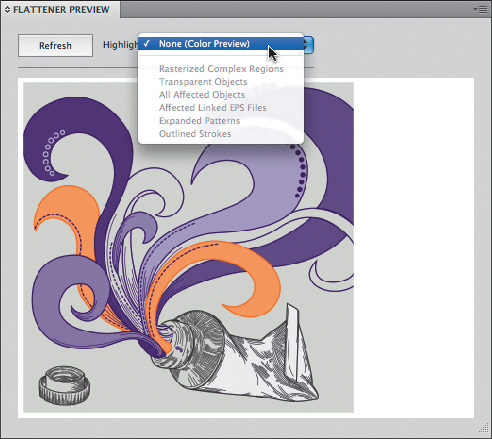 To take advantage of all that the Flattener Preview panel can offer, adjust the different flattener settings, and preview the results—making changes or adjustments where necessary—before you actually print the file. As an aside, InDesign and Acrobat Pro also contain a similar Flattener Preview panel and identical flattener settings (in fact, it’s the same underlying code). What Kind of RIP Are You Using? To throw yet another variable into the mix, the kind of printer or RIP you use also affects your results. Any Adobe PostScript LanguageLevel 3 device should be able to handle transparency without issue. Specifically, PostScript version 3015 (which appears in the latest versions of RIPs) can process files that have been flattened. It’s important to remember that flattening has to occur for any RIP to understand how to print transparency. If your RIP can process PDF files, that doesn’t necessarily mean it can process PDF files with transparency in them. If you’re in doubt, check with your RIP manufacturer to find out whether transparency flattening can occur inside the RIP or whether you need to print files from an Adobe application to flatten them. Some older print devices are confused by the effects of flattening. For example, a Scitex Brisque RIP (since acquired by Creo and now Kodak) looks at jobs that are printing and splits up the vector and raster elements onto two “layers.” The rasterized content prints on a continuous tone (CT) layer at a lower resolution (such as 300 dpi), and line art prints on a separate vector layer at a much higher resolution (such as 2400 dpi). Because flattening could cause a vector object to be rasterized, the RIP sees that raster only as a CT image and prints it at the lower resolution. This might cause text that is rasterized to print with noticeably jagged edges. There’s an update available for Brisque RIPs to address this issue, but that doesn’t automatically mean everyone who owns a Brisque has installed the update (or knows it exists). Rampage RIPs experience similar issues, although turning off the dual-mode setting addresses them. The best advice in any case is to talk with your printer. For any big job, most printers will be happy to run a test file for you to make sure everything will print correctly. Taking advantage of these opportunities will surely save you headaches when press deadlines loom. Adobe also has free specialized training materials for print service providers if your printer needs more information (online at http://www.adobe.com/print). Use the right flattener presets—Low Resolution, Medium Resolution, and High Resolution. For quick proofs to your laser printer, you can use the Low Resolution or Medium Resolution setting, but when you’re printing to a high-end proofer or imagesetter, use the High Resolution setting. You’ll find the Transparency Flattener settings in the Advanced panel of the Print dialog box. To avoid text becoming rasterized, create a new layer in your Illustrator file, and place all your text on that layer. As long as you keep that text layer as the top layer in your document, you won’t have to worry about chunky or pixelated text because of rasterization. 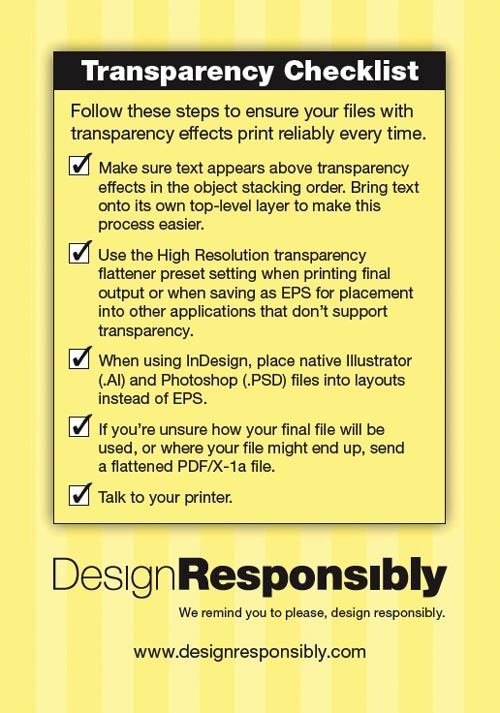 If you’d like an easy way to remember the important steps to get great results when printing, a small transparency checklist (Figure 13, courtesy of Design Responsibly), is available when you register at www.peachpit.com/rwillcs5. Figure 13. The transparency checklist offers a few quick reminders to help ensure your file prints correctly. Designing with transparency allows you to design creations that were previously prohibitive and difficult to implement, thus allowing you to save valuable time while being even more creative. Now that you know how transparency works and what’s necessary to use it in your workflow, give it a test drive. You’ll be happy you did.